On September 1, 1913, aeronaut Jack Crosby, 35, was giving a balloon exhibition at a fair in Salisbury, Connecticut. Part of his act involved him to hang by his teeth while suspended from his balloon. As he was performing about 75 feet in the air before a crowd of about 4,000 people, his balloon suddenly began to collapse, and as it fell it struck a telephone pole. The impact knocked Crosby loose and he fell to the ground and received critical injuries. The half inflated balloon then came down upon several spectators injuring some of them. Crosby was transported to the hospital in Winsted. The source for this story was dated July 11, 1904, but the date of the incident was reported as “a few weeks ago”, which assumedly means it occurred sometime during the month of June. A woman identified as Miss Carrie Meyers was scheduled to give a balloon exhibition at a charity event being held in Bridgeport. All seemed to be going well as she made her ascent, until she reached an altitude of between 400 and 500 feet, and the balloon suddenly caught fire. 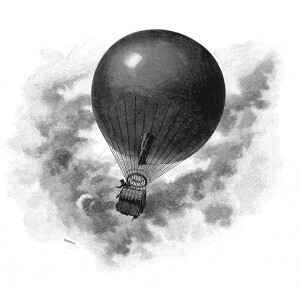 As the flames rose, Miss Meyers attempted to leave the balloon using a parachute, but was unable to effect its release from the gondola. In short order the flames ate through the balloon causing it to plunge to the ground where it dropped into a large tree which miraculously broke the fall. When spectators rushed over they discovered that Miss Meyers had suffered only minor injuries. At about 5 p.m., on August 2, 1901, aeronaut Frank P. McBride, of Meriden, Connecticut, made a balloon ascension from the Point-of-Pines section of the town of Revere. Just as the balloon reached an altitude of 100 feet it suddenly collapsed, and began to fall. McBride was too low to use his parachute, and was forced to stay with the balloon. Thankfully a cross-wind helped to slow the craft’s downward speed, pushing it sideways as it fell. When the gondola hit the ground McBride was flipped from the basket and landed on his feet, breaking a bone in his left heel and injuring his back. McBride was injured in another balloon accident on July 18, 1901, when he ascended from Ulmer Park, New Jersey. While over Brooklyn, New York, a strong wind buffeted his balloon against trees and buildings before he was finally pitched through a window. On August 31, 1921, a balloon ascension and parachute jump demonstration was scheduled to be given at the Barnstable fair grounds in celebration of Governor’s Day. As the balloon stood fully inflated before a crowd of 20,000 people, someone erroneously gave the order for it to be released without making sure it was safe to do so. As it rose from the ground, 22-year-old Edward Wolfe of New Bedford became entangled in one of the ropes and was pulled upwards by his legs. Wolf managed to quickly free himself and fell about ten feet to the ground suffering numerous bumps and bruises. Meanwhile the balloon continued upwards with 22-year-old A. Morin, the parachutist, still aboard. At the proper altitude, Morin jumped and deployed his chute, but when he was barely 100 feet above the ground, the wind tore his parachute, sending him plummeting onto a hillside where he broke his right leg and several ribs. On July 4, 1866, a balloon exhibition was scheduled to take place at State-House Square in Hartford, however as the balloon lay tethered to the ground, clouds began to move in and the wind began to increase. Despite the change in weather, the two aeronauts, identified only as Sweet and Bassett, insisted the show would go on. Once the balloon was aloft, Sweet was to give a performance on a trapeze suspended beneath the gondola, but as the wind began to blow harder he began having second thoughts. Bassett, however, did not, and climbed into the gondola and gave the signal to release the balloon. Unfortunately, there was a delay by some who were holding the tether ropes, for they all didn’t let go in unison. Consequently the balloon swung into some telegraph wires which cut the string which held the anchor rope. The anchor released without Bassett’s knowledge, and as the balloon began to rise the anchor snagged in the wires, causing the balloon to uncontrollably blow back and forth with the increasing wind. Bassett, still unaware that the anchor was holding the balloon down, began tossing ballast overboard to get it to rise, but without success. Once he realized the situation, he called to those on the ground to cut the rope, which they were unable to do because the wires on the poles were out of reach. The wind continued to grow stronger and pushed the balloon into some trees where the emergency cord which would allow the balloon to be rapidly deflated was severed, leaving Bassett no way to bring the balloon down. Then the wind began pushing the balloon back and forth, smashing it into the trees, and then away. At one point as it came into the trees, Basset leaped out and grabbed hold of the branches. He did so not a moment too soon, for as he was clinging to the upper part of the tree, the anchor rope suddenly ripped free from the gondola, which sent the balloon shooting skyward with nobody inside! The balloon, which was valued at somewhere between $800 to $1,000, was last seen heading northward and upward, until it was nothing more than a mere speck in the sky. What became of it is not recorded.